We are twelve years old! Founded in January 2007, Shamrock Haiku Journal has since been published regularly. On this occasion, we have prepared SHAMROCK HAIKU JOURNAL: 2012– 2018, a print edition of the twenty issues of Shamrock, Nos. 21 to 40, as they appeared on the Shamrock website. This paper-based collection covers the full range of English-language haiku, from classical to experimental, as well as haibun. Also included are English translations from one of the most prominent Japanese haiku poets of the 20th century, Ryuta Iida, and an essay on translating Matsuo Basho's haiku. We congratulate the worthy winners, and express our sincere gratitude to each and every reader who cast a vote. There are excellent poems aplenty on that page; check them out! After 3 days in Ooty’s scenic beauty, we return to Chennai in a car. We are treated to lush greenery of different shades and pine trees draping their branches around each other. A teenager, I am engrossed in Nancy Drew, occasionally lifting my head to peep out of the window. With the gentle breeze bringing fragrance of different flowers, my brother adjusting his camera and my parents talking softly to themselves, I am filled with a sense of security and contentment as I drift to sleep. Copyright © 2019 by Shamrock Haiku Journal. All rights reserved. 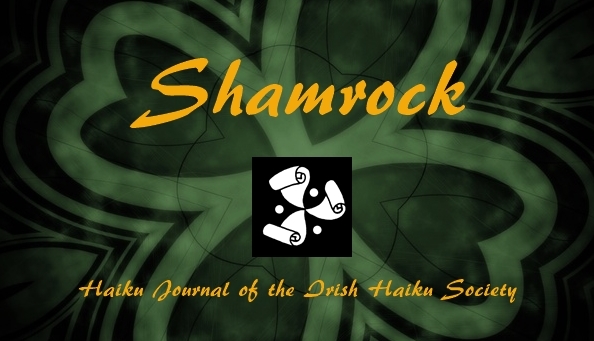 All the Shamrock Haiku Journal contents are copyright by the indicated poets/artists. All the rights revert to the authors and artists upon publication in Shamrock. Any unauthorised copying of the contents of Shamrock Haiku Journal is strictly forbidden. The Shamrock logo image is copyright © by Christine Zeytounian-Belous (Paris, France).